Following an initiative of the Angelo Roncalli Committee of the International Raoul Wallenberg Foundation the Argentine Postal Office issued a Postal Card commemorating the former Vatican’s Delegate and Apostolic Nuncio. The postal piece was printed using the offset tecnique, in five colours; four in process plus a metalized ink. It´s dimensions are15,5 x 10,5 cms. The initial issue comprised 8,000 units with a value of 75 cents each one. 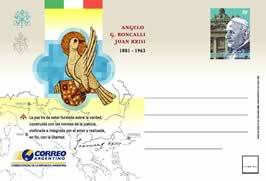 Its design presents themes related to John XXIII and a sentence that refers to Peace. The map was printed in silver ink. 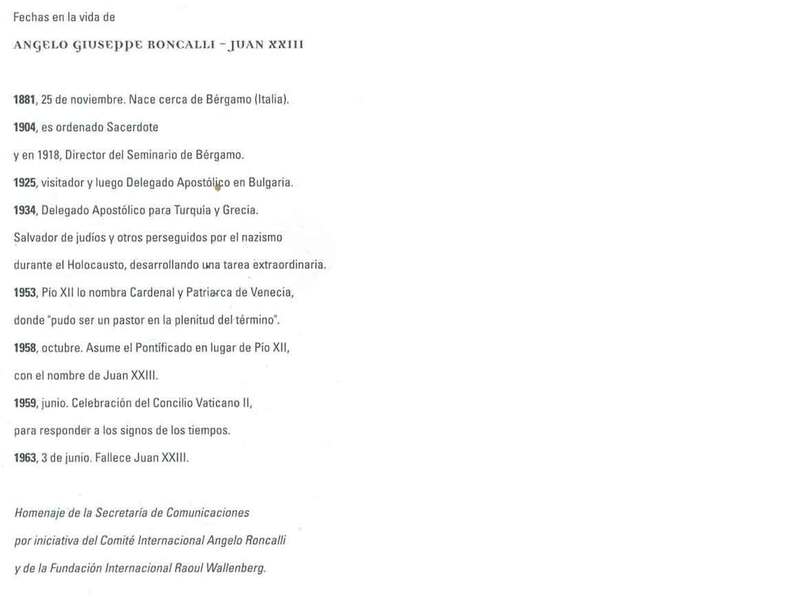 Roncalli was the Vatican Apostolic Delegate in Istanbul in l944 where he organized a safety net for Jews and others persecuted by the Nazis. Thanks to his actions, thousands of people condemned to death saved their lives. His work and achievements put him alongside other diplomatic saviors of the Holocaust such as Raoul Wallenberg (Sweden), Aristides de Sousa Mendes (Portugal), or Harry Bingham (United States). In l958, he was appointed Pope and adopted the name John XXIII. He died on June 3, l963, following one of the most memorable papacies, in particular on the matter of the inter-confessional dialogue. 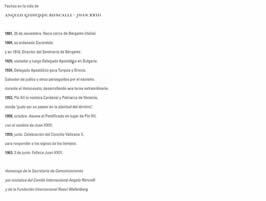 In order to pay tribute to his memory and his humanitarian behavior, the International Raoul Wallenberg Foundation set up the International Angelo Giuseppe Roncalli Committee with the support of Cardinal Angelo Sodano, Secretary of State of the Vatican.